Image: Juj Winn/Getty Images, Annabelle Breakey/Getty Images. Design: Kenzie Mastroe/SheKnows. All across the United States, Americans are getting ready to vote. In fact, if you live in one of the 34 states that allows early voting, you may have exercised your democratic right already. However, if you haven't made it to the polls yet, you've got one more chance because Nov. 6 is Election Day. According to Thrillist, Shake Shack is offering a free order of fries to everyone who votes. Simply present an “I Voted” sticker or redeem with the code “ivoted” in the chain's Shack App. Note: This offer is only valid with the purchase of an additional food or beverage product. Potbelly Sandwich Shops are giving guests free cookies on Tuesday and Wednesday with any purchase. All customers need to do is show their "I Voted" sticker. Get $1 off any sub Tuesday with your "I Voted" sticker. Unlike most of the other deals, California Tortilla customers do not need to present anything to obtain their free menu item. Simply say, “I voted,” and get free chips and queso with any purchase. Much like California Tortilla, all you need to do to receive your free brewed or cold-brewed coffee is say, "I voted." 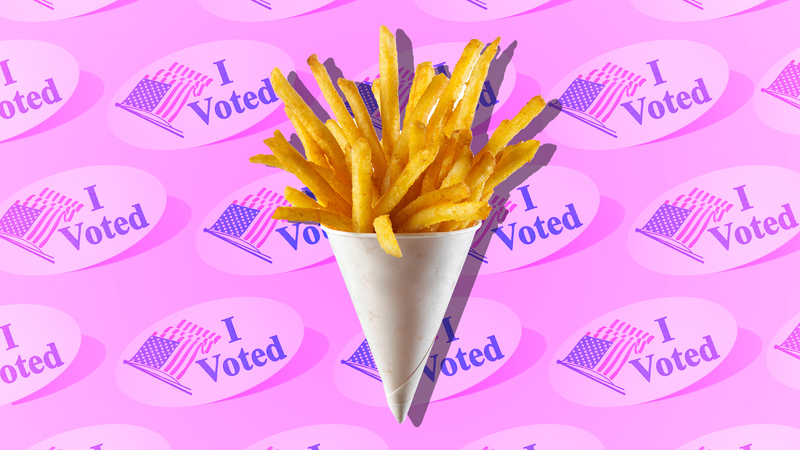 Get a free Fatz sweet tea with the purchase of an entrée — and an “I Voted” sticker. New York-based bagel chain Black Seed Bagels will be giving out free cups of hot Stumptown coffee with any purchase. To redeem, simply present your voting sticker. Go to any Birch Coffee location on Tuesday to get a free drip coffee. (Yes, totally free. No additional purchase necessary.) To receive it, just show off your "I Voted" sticker. The world-famous cupcake chain is offering — you guessed it — a free cupcake! All you have to do is walk in and show your "I Voted" sticker. If you can't make it into a store, Baked by Melissa is offering a 10 percent off discount code for online orders placed between Nov. 6 and 7. Just use the code "IVOTED2018" when you check out.